The Littleport Society Open Day takes place at The Barn, Littleport, Cambridgeshire, on Saturday 19th September 2015, 10am – 4pm, with FREE ENTRY. The Littleport Society are opening their doors on Saturday 19th September 2015 – with free entry to a range of specially built displays. I’ve known the Society for many years, having helped them with their first web presence back in 1998. Earlier this year I was co-opted onto their Committee, and this is allowing me to help them with digitally cataloguing their huge archive of items which ranges from dinosaur fossils, right through to Manorial Records, wartime documents, and the latest community leaflets and photos from 2015! The Open Day will give you the chance to learn more about your Littleport ancestors, find out what your ancestors may have done, and how The Great War affected the lives of those in Littleport. Entry and parking is FREE, and the doors open at The Barn (off Main Street) from 10am until 4pm. For the latest information, check out The Littleport Society website. Cambridge plays host to another Family History Fair on Saturday 25th October 2014. The Cambridgeshire Family History Society has announced its Family History Fair is to return on 25th October 2014, after the success of last year’s event. Girton Glebe Primary School plays host once again to a day’s worth of family history – with free admission and parking. Last year’s event saw a mixture of stands from Cambridgeshire, but also from neighbouring counties and genealogy and history organisations covering the local area. A series of lectures will be announced nearer the time – I particularly enjoyed last year’s one on dating photographs by Tom Doig. For more information about the event, how to book a stand, and all the latest on that expert talks timetable – check out the Society website. Combining my love for genealogy and infographics – yes! it’s a genealogy infographic. I’d been looking for an excuse to combine my love for infographics (small chunks of information delivered as graphics) with my love for genealogy, and now I’ve achieved it. Here’s my first attempt at combining the two. Using the data buried in my Reunion10 Mac software (see Reports > Statistics), I’ve managed to pull some key figures from the data I have against my maternal Barber family in a bid to make genealogy that little bit more interesting for those relatives who nod and smile when you start talking about ‘the tree’ and hand them a print out showing names of people they’ve never heard of. Maybe this format will help capture their interest and give them some interesting/quirky facts to remember. 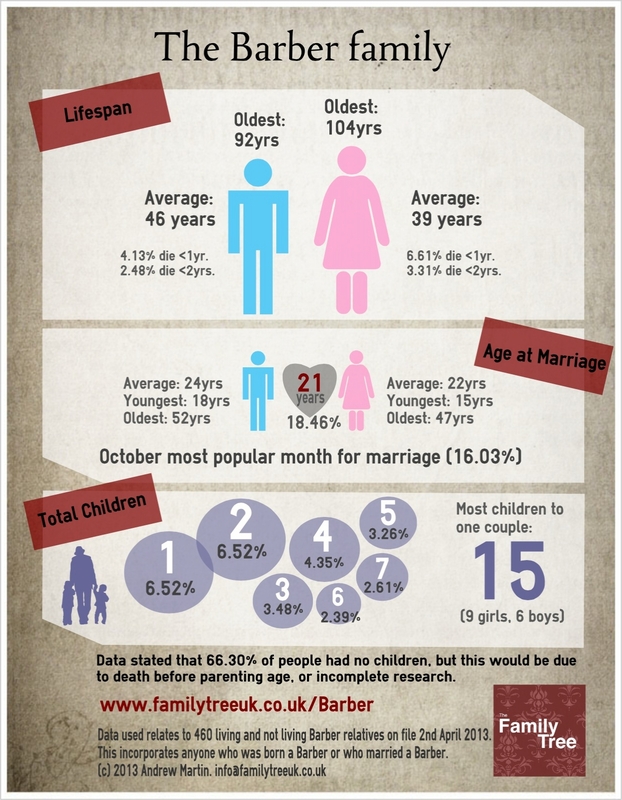 An infographic created using my Barber family data. I had quite a bit of fun making this, so will probably create some more in due course. Click the image if you want to see a larger version. What motivates children to take an interest in genealogy? I remember being about 11 or 12 and sitting in the front rooms of both sets of maternal Great Grandparents and being completely bored by tails of the war years. Whilst one Gt Grandfather saw action in Egypt and other places, whilst the other was with the Home Guard, yet to my child ears, they were so utterly boring. As a child, I didn’t want to know about ‘The War’. It meant nothing to me, and I couldn’t comprehend the date, why people would want to fight each other, and certainly not the scale of what actually took place. My mother was the same – she too had spent many hours listening to the very same stories as a child, and had not been interested either. Now, as an adult, with those Great Grandparents all deceased, I’m left with a gap. An unrecorded gap in oral history, in personal history, and with only a few pay-to-view scanned documents sitting in sites like Ancestry or FindMyPast. 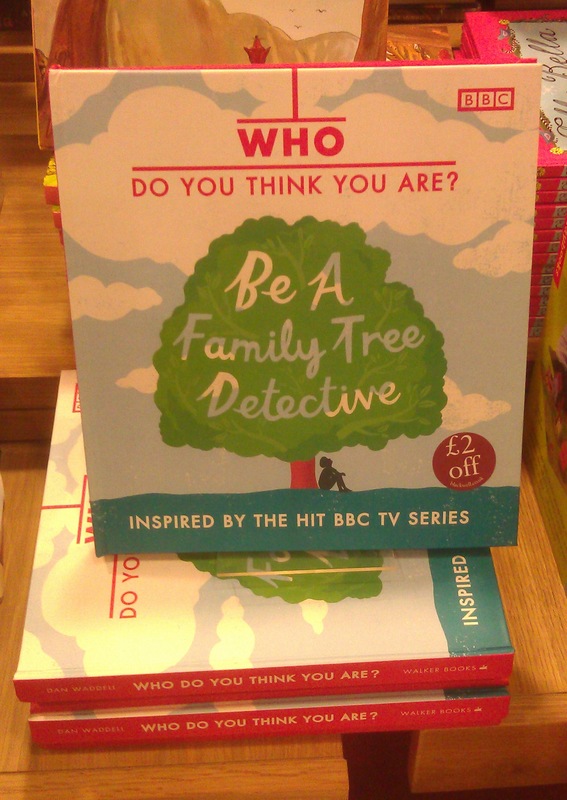 I was in Cambridge earlier today, picking up a few last minute Christmas presents when I spotted the following book from the Who Do You Think You Are? brand. I generally don’t buy genealogy books, as I rely on online information, but this one was different – it was aimed at children. I picked it up and flicked through, to find that it was full of colourful pictures, flaps to reveal information, and more along the lines of a pop-up book (without the pop-up bit). 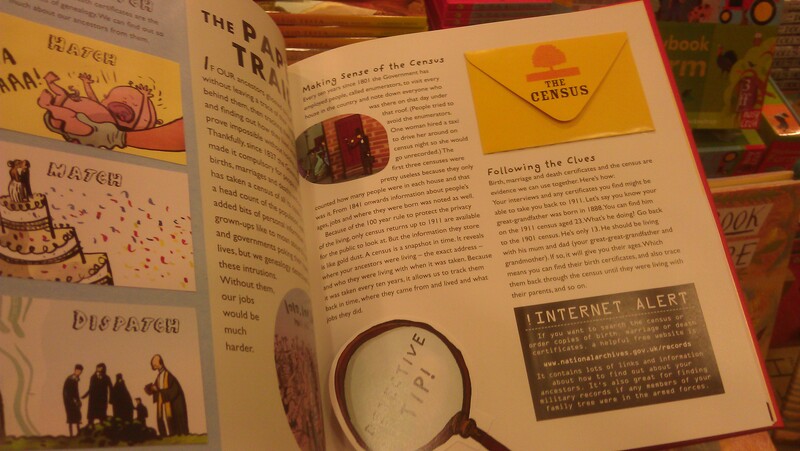 Inside the book – open the envelope to look at Census, lift the magnifying glass to reveal a tip. I wondered what it was that inspired me to start (although admittedly i was 16/17yrs old) – knowing that it wasn’t anything like this. Had it have been, i would most likely have been hooked and written down the stories (or at least listened and perhaps remembered some of them) at a much younger age. I also got home to find that Who Do You Think You Are? 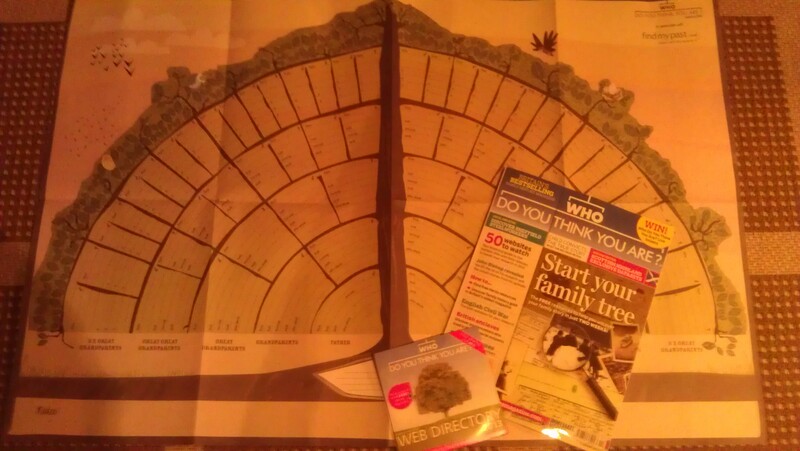 magazine had also landed on my doormat – the January edition – and inside was a great tree chart from FindMyPast – encouraging people to fill in their ancestors. What a great way to help inspire kids to think about the past lives of their family? The free FindMyPast tree chart with the January 2013 edition of Who Do You Think You Are? magazine. What was it that motivated you, and at what age? The dates for the seventh Who Do You Think You Are? 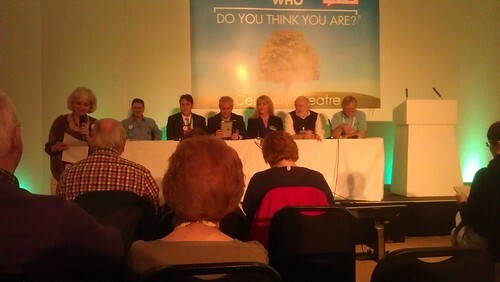 Live genealogy show in London Olympia have been announced for 2013. Once again, Olympia London plays host to the 7th Who Do You Think You Are? Live genealogy and history show. I’m excited about the 2013 WDYTYA? Live show which runs from 22nd to 24th February. The event website – which will be properly updated soon – is now counting down to the 3 day genealogy feast. Tickets go on sale on the 7th of November, and in a nod to these tough financial times – the ticket prices are remaining the same price as in 2012! I first attended in 2011 – a late starter on this front – but having also visited in 2012, I recommend going along. On my first visit, I found myself wandering around, tweeting, and browsing the plateau of stands from societies and those large commercial organisation stands. This can be quite tiring, and whilst there are lots of great stands, not everything will be relevant to you and your research. In 2012 I booked myself onto a couple of workshops, and found this to be a much better approach to the day – giving me great advice from experts, and also some structure to my day. I attended the workshops ‘Google Search Strategies for the Family Historian’ by the brilliant genealogist, author and Genealogy Gems podcaster – Lisa Louise Cooke, and “Breaking the barriers of Social Networking – Strategies and Tricks” with the fantastic Else Churchill (of the Society of Genealogists) keeping an expert panel in order. If you’re like me, and can’t peel yourself away from social media for any more than five minutes, then I recommend using twitter whilst at the event. In the past, the event has had its own hashtag (a # symbol followed immediately by a word or initialism relating to that specific event). These hashtags are great for keeping up to date with conversation and inside information about the event whilst at the event! It’s like tuning into the grapevine. If you are a twitter user, you can get free apps for your smartphone and tablet device that will let you keep track and contribute to the real-time event conversation. I found this particularly useful and fun, as it enabled me to have conversations with other genealogists at the event. It is even common for people to tweet quotes and advice in real-time from the very workshop they are sitting in! Look out for the event hashtag in 2013! You can even take this further by using this conversation to meet up with other tweeting genealogists on the day. This is something that I will be trying to do more at 2013’s event. Follow me on twitter at @FamilyTreeUK and let’s tweet up! Leave yourself plenty of time if you’re traveling via London Underground – Earls Court station gets very busy and isn’t the easiest to navigate. Be prepared for lots of walking and standing….. and talking! Book tickets for the ‘big’ workshops and talks online as early as you can – many of these were sold out weeks in advance. How a carer could add extra information to your genealogy research. I had a lovely email the other day from a lady who had found information about one of my late distant Yarrow cousins via Google. She used to be her care giver. Having realised that she was looking at my Yarrow tree, she decided to drop me an email to tell me about her work caring for one of my relatives in her later years. Carers may hold the key to some of your un-answered genealogy questions. This took me by surprise, as I’ve not received this kind of correspondence before, but as she mentioned a few specific details about the relative that she would not have found elsewhere, it got me thinking as to just how much information might your relatives be telling, or have told, their carers? Think about how many nameless faces turn up in antiques and house-clearance stores – those long-lost loved ones who will rarely find their way back into the families they belong to. Yet, a carer may well have heard many stories about the people in these photos, and be able to give you some small clues as to the identities. Alternatively, they may have remembered being told about the childhood lives of your relatives. Tracking down a carer for your elderly relative may be very difficult, but if they worked as part of a carer company, then you may be able to ask the company to pass on your contact details in a hope that they might respond. With any luck, they may be able to give you some time for a phone interview. Stories can fade or become muddled as time goes on, even those stories that have been told every time the busy carer visited. The caring profession is generally poorly paid (in the UK at least, with some people receiving no pay at all) and therefore carers move around quickly – and internationally – so if you leave it too long, then you may never be able to trace your relative’s carer. A word of caution though, carers have no obligation to contact you, and they work extremely hard with a lot of clients – and therefore they genuinely may not have any useful information for you. Some carers work in very difficult circumstances, so recalling details may be impossible or painful for them, or simply outside of their confidentiality comfort zone. Tombstone Tuesday – A weekly blogging meme. 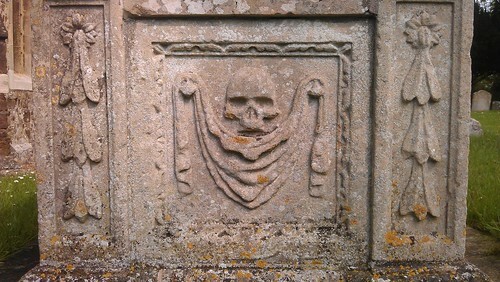 This week it’s an ornately carved tomb of William Heylock in the churchyard of Abbotsley in Huntingdonshire, England. 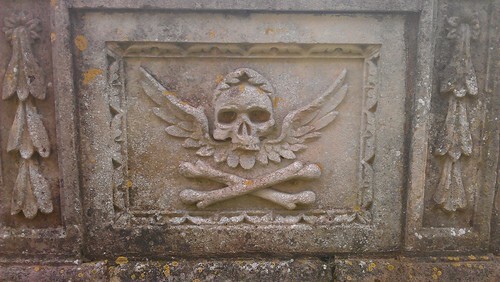 William Heylock's grave at Abbotsley has ornate carvings. Spotted this tomb with ornate carvings on it at the weekend in Abbotsley, Cambridgeshire (or Huntingdonshire as it was when the person was buried). The tomb belongs to William Heylock, the son-in-law of the then vicar James Aspinall at the time of William’s burial in 1688. William’s tomb is part of a memorial to his generosity – he had given £5 per year (remember, this was written in 1688. £5 in 1688 had the same spending worth as £437 in 2005) to the poor people of the parish each year, and £1 to the vicar each year. He also gets a mention inside the church. Notes suggest that his family held land in Hertfordshire and Bedfordshire – which probably accounts for his wealth. Mother’s Day – a celebration of motherhood. Today is Mother’s Day here in the UK. To mark this day, I thought I would share a few words about three amazing women in my tree. Ann Bowers was born in 1843 in Wicken, Cambridgeshire. She was penultimate of the eight child of Henry Bowers and Ann Bailey. 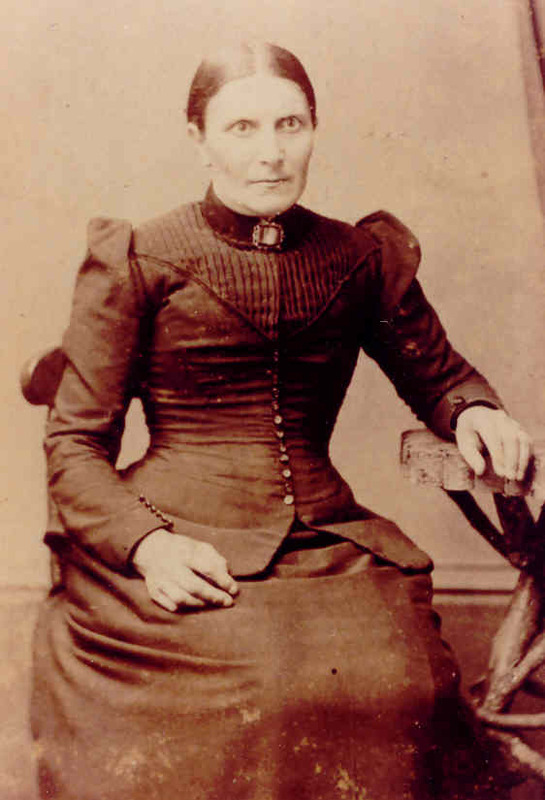 Marrying labourer James Simpson Bishop in 1860, it wasn’t long before she began their family with the birth of their first child Ann Elizabeth Bishop in 1861. Over the next 26 years she bore another 17 children. It appears that two of these children died in their infancy. Ann, who must have been exhausted from her continuous pregnancies and looking after an army of children, eventually succumbed to pneumonia in March 1889 and died aged 45 years. Her youngest child was just 2yrs old. With a total of 16 living children, their labourer father would have struggled immensely to provide and care for them had it not have been for Sarah Farby (née Bowers) – Ann’s married and childless sister. Sarah Bowers was Ann’s (above) older sister. She married George Farby but the couple never had any children of their own. However, they lived close to the growing Bishop household and therefore Sarah helped Ann to care for her children, and upon Ann’s death in 1889, Sarah was there to help care for the children – the youngest, George Juble Bishop, being just 2yrs old. As the family grew up and started having their own children and grandchildren, Sarah continued to care for them – earning herself the affectionate name of ‘Granny Farby’. She died just under 2 months after the death of her husband in 1920. Sarah, born in 1852, was the illegitimate daughter of Elizabeth Giddings of March, Cambridgeshire. The stigma that accompanied this fact will have worked against her and her mother from the moment that the pregnancy became known. Sarah didn’t just face this hurdle in life – when she was 21 she lost her mother (aged 41-42yrs old). 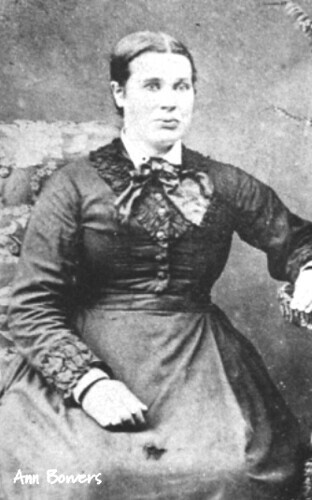 The following year (1874) she married James Martin and the couple bore their first child that year. In total, they had 12 children, but sadly, Sarah was to outlive 6 of her children, and 2 of their spouses. Son Herbert died in a horrific train accident in France; Albert died in a German hospital; her daughter Emma and Emma’s husband both died in 1917 – leaving their orphaned daughter Mary. Sarah’s 11yr old son William Martin died after an accident whilst working on a horse and cart in 1890; her daughter Mary died on her day of birth in 1886; and her son Percy died within the first year of his life. Sarah died in 1925 – a mother and a grandmother.